Dogs and kids—they go together perfectly, right? Not always! While children and their dogs can enjoy a wonderful relationship, it takes some time, training, and patience to establish a harmonious home. Here are four tips to help keep both your dog and child safe and happy together. Respect Your Dog. Above all, respect your dog! As hard as it may be to imagine, not all dogs appreciate the company of children. Don’t force these kinds of interactions on your canine companion—this could lead to a host of negative consequences, including a bite. If your dog reacts negatively when in your child’s proximity, contact a trainer or behaviorist, both of whom are better equipped to deal with the issue. One step that you can take yourself is to provide the dog with a safe place to retreat to (such as a crate or comfy bed) when things get hectic. Supervise. 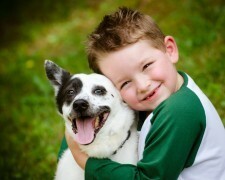 Children—especially younger kids—should be supervised around the family dog. Rough play or an accidental tumble could result in defensive growling, snapping, or even biting. By the same token, your dog must be supervised as well to prevent unintended injury to your child; know that both his breed type and activity level may affect how well he interacts with children. Teach Proper Manners. First, ensure that your child remains safe around the family dog by teaching boundaries. For example, proper body language, like approaching a dog from the back or the side and not hovering over him, is extremely important. Encourage your child to play calmly with him, avoid direct eye contact, and refrain from picking him up. Also, explain to her that Fido needs to be alone at times, and his personal space should be respected. Your dog should be schooled in basic obedience techniques, such as sit, down, come, stay, leave it, and drop it. A well-trained canine is easier to manage around small children. Reward Good Behavior. The best motivation for appropriate doggy behavior usually takes the place of positive reinforcement—namely in the form of a treat! To encourage positive interactions, give Fido a yummy morsel every time he plays gently with or around your child. A dog who is rewarded for calm manners is more likely to continue behaving in this way. The same holds true for your child! Reinforcing her for showing consideration and demonstrating correct play with the dog will help strengthen their bond.